Join the discussion on our forums! 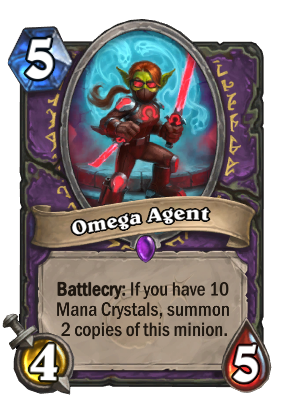 Come discuss Omega Agent over in our dedicated Omega Agent discussion topic. So I was wondering, does anybody know if hand-buffing this minion makes the copies bigger as well? If so doesn't it outshine Hi'reek in every way? It might actually worth crafing if it keeps buffs. People are sleeping on this card. Yes, its bad if played before 10, but in Zoolock, you can afford to hold it if you happen to have it before 10 because you are tapping and generally have something decent to play. Three 4/5s are great for 5 mana. You can Fungalmancer two of them or play Giggling Inventor to protect them. In arena either you win the turn they play this, have a Warpath/Dragon's Fury/Nether, or just lose on the spot. Maybe the only stupid card of the expansion, but it's soooo insanely stupid. I already hate playing against this card in arena. If you also have a Fungalmancer to go with it in arena, It's kind of OP. No wonder Warlock is the best class in arena right now. I bet is because of this card mostly. I think this card is a lot better than what a lot of the top players give it credit for. I don't think this card is great but I think it's playable in constructed. You just pretend this card says 10 mana summon 3 4/5, battle cry gain 5 mana crystals and it's not that bad. Playing it as a desparate 5 mana 4/5 is just a bonus. Card art looks like a rogue card, rogues are about assasins not locks. also this card would be much better as a rogue card as rogue lacks powerful turn 10 plays other than just kill you where as lock has lots of powerful late game plays with gul'dan and n'zoth in wild. What are the chances that they introduce some kind of hand buff to warlock cards anytime in the near future...? Help me out here. Do you need to pay all 10 mana crystals to play this effect OR just have 10 mana crystals even if you spent some of them? From what I understand you need to have 10 unused mana crystals for this to work. so it has to be your turn 10 or turn 9 and you still have the coin. It only uses 5 mana because that's the cost of the minion. you would still have 5 mana left after you play it. If you play it without 10 mana crystals it will just be a 5 mana 4/5. From my experience, you don't have to have 10 unused mana crystals, i.e. you can have 5/10 mana crystals unspent and still get the full effects of this card. 12/15 on 3 bodies combined for only 5 mana? Where the hell is this game going to? This is so OP for only 5 mana. It's a rogue that works for Gul'dan, how hard is that to believe? Maybe she's getting a good pay check. Why is it not a Paladin card?! Great synergy with Val'anyr! Why Warlock? !